If you have ever thought that history is static, here’s proof that it is a living, changing thing. For many years, we have learned that toward the end of the Ice Age, people trudged over the so-called Bering land bridge that linked northeastern Asia to what is now Alaska. From there they spread out to become the first inhabitants of North and South America. These hardy folk hunted with well-shaped stone tools, called Clovis points for the site near Clovis, New Mexico, where they were first found. For years, though, puzzling evidence has indicated that the Americas were not empty of human life when these skilled, stalwart migrants arrived. Archaeologists have found site after site that have artifacts thousands of years older than any Clovis points. Was someone here already when the Clovis people arrived? If so, where did they come from? How did they get here? Reevaluation of a mammoth bone and the weapon lodged in it has now answered the first of these questions once and for all. Using the most recent dating methods, archaeologists have determined that the mammoth was killed 13,800 years ago—give or take 20 years. That’s at least 800 years older than the very earliest Clovis artifacts. So the so-called “Clovis first” theory is defunct. The new finding sheds light on another mystery too—why the “megafauna,” such as mammoths, giant sloths, and saber-toothed cats, disappeared so quickly from the Americas about 12,700 years ago. 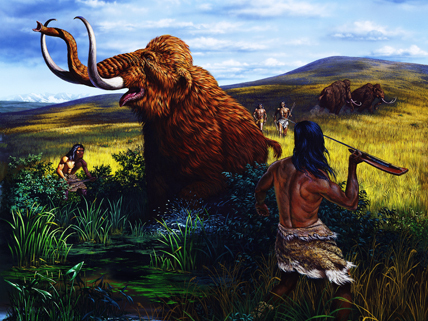 The early inhabitants, whoever they were, had been hunting these animals for hundreds, if not thousands, of years before the Clovis people arrived. The Clovis people just finished them off! Image credit: © Chase Studio/Photo Researchers, Inc.
Read about how the mammoth bone and the point lodged in it were dated. Get background on the controversy at this site. Learn about a very different theory of the peopling of the Americas, involving prehistoric European peoples. Watch all or part of this 13-episode documentary about human development and prehistory from an evolutionary perspective, featuring the work of Stanford geneticist L. Luca Cavalli-Sforza. “If you have ever thought that history is static, here’s proof that it is a living, changing thing.” History doesn’t change, but the way people perceive it does. You put the lime in the couocnt and drink the article up. Using the most recent dating methods, archaeologists have determined that the mammoth was killed 13,800 years ago—give or take 20 years. That’s at least 800 years older than the very earliest Clovis artifacts. this page is … Boring!!!!! Not all archaeologists agree with these findings. Lots of controversy.